The Basque country, runs from the border with France, along the northern coast of Spain beyond the city of Bilbao. The Atlantic and mountainous regions give a ruggedness to this area with famous cuisine and such delights as Bilbao's Guggenheim art museum. The region is also well known for it's cuisine, San Sebastian being reported to have more Michelin stars on it's restuarants (per population) than Paris. Specialities of the region include shellfish and other seafoods. The Basque Country can be accessed by the airport at Bilbao or by ferry to Bilbao. Occupying the coastline in the eastern corner of the region, Guipúzcoa (Gipuzkoa in the Basque language) has San Sebastian (Donostia in Basque) as it's capital city. 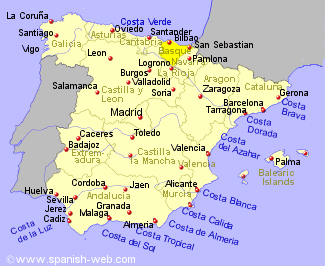 This province, the smallest of mainland Spain has a green (due to adequate year round rainfall) and hilly terrain. The is the part of the Basque region where you are most likely to find the Basque language being used. We have self catering holiday rentals in Guipuzcoa in or near the following towns. Vizcaya (Bizkaia in Basque, or Biscay in English) lies on the coast at the western corner of the region, with Bilbao as it's capital city. This is one of the most prosperous provinces in Spain, due to industrial developments which started at the beginning of the 20th century, though service industries ad tourism are now also important. We have self catering holiday rentals in Vizcaya in or near the following towns. This, the largest of the 3 provinces of the Basque region, and the most sparsely populated, has Vitoria as it's capital city, sitting in a large fertile basin surrounded by hilly countryside. This was very much an agricultural province though a considerable amount of industry has developed around Vitoria in more recent years.